But it doesn't look good: throughout the early evening on Wednesday there are increasing reports of tanks and heavy artillery being amassed along the border on both sides, specifically near the Pakistani border town of Sialkot, where video appears to confirm major Pakistani Army deployments. Though Pakistani prime minister Imran Khan in a televised address to the nation called for immediate peace talks between the bitter enemies, saying that “better sense should prevail,” Indian leaders and the public were enraged when Pakistan released a video of the detained Indian pilot, filmed identifying himself as Commander Abhinandan Varthaman. When an interrogator asked for more information beyond basic identifying questions, the pilot replied, “I am sorry, sir, that’s all I’m supposed to tell you.” Pakistan's information ministry had also shared footage showing the pilot blindfolded and with blood on his face. 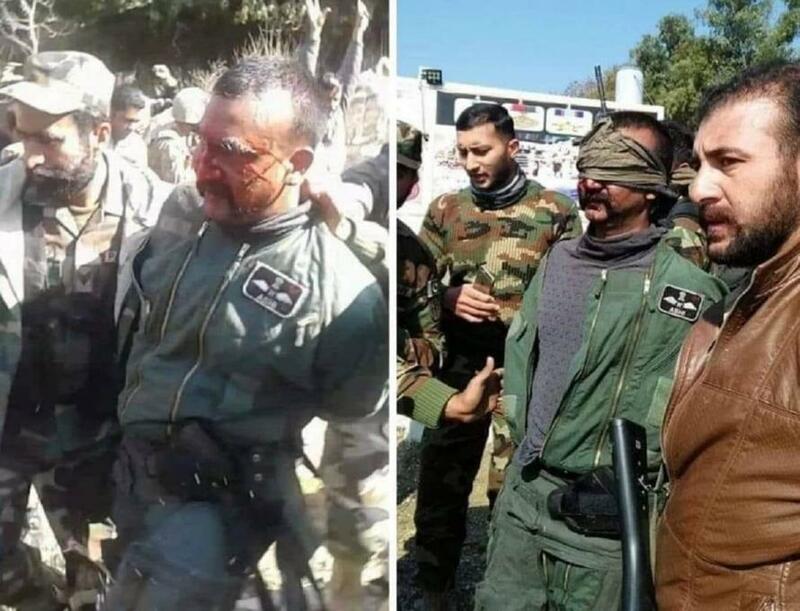 This particular footage appears to have been taken just after he was apprehended by the army, and just after being beaten by local Kashmiris when his parachute deployed and he landed on the Pakistani-administered side. India immediately condemned the video parading the pilot on a public broadcast as a "vulgar display of an injured personnel" which "violates all norms of international humanitarian law." Still frames from footage released by Pakistan in the aftermath of the shoot down. India has demanded the immediate release of the pilot amidst the continuing blame game and escalating war of words that seems quickly giving way to real war, following reports of sporadic troop clashes on the border. A number of western legal pundits were quick to point out that Pakistan indeed likely violated the Geneva Conventions by tweeting video of captured Indian pilot, which forbids publicizing images of prisoners for “insults and public curiosity.” The information ministry quickly deleted the tweet, which included a moment in which the prisoner requested water. Video released by Pakistan's military and information ministry that appears to have violated the Geneva Conventions. Currently news of the pilot's fate is dominating news and discourse in India, with the national election scheduled at the end of May taking a momentary backseat, as war is now on the table. The potential for national fervor favoring drastic response could drive political leadership to escalate during this sensitive time, ahead of a key election. Pakistan's information further tweeted a "congratulations" message praising the downing of the two Indian jets early on Wednesday. Meanwhile at a time Pakistani officials and media appear to be positively celebrating, and while the prime minister makes what India will surely take as disingenuous calls for deescalation, it appears preparations for war are underway. The Daily Mail reports: "India is preparing for war with the construction of 14,000 bunkers to protect families on the Pakistan border as Islamabad invokes the spectre of nuclear conflict, telling India 'better sense' is needed. The "better sense" remark came during Khan's televised statement. He said: "If escalation begins from here, where will it go?" And referencing the worrisome fact that each side possesses some 150 nuclear warheads, Khan added: "Can we afford any miscalculation with the kind of weapons that we have and you have?" After which he concluded, "I once again invite India to come to the negotiating table," so that "Better sense should prevail."